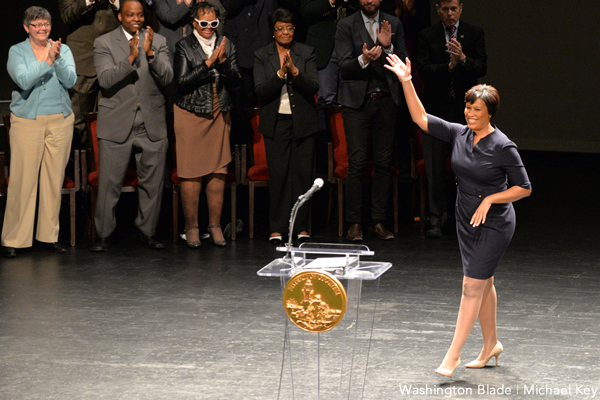 Muriel Bowser delivered her State of the District speech last week at the beautiful Arena Stage Theater in Southwest, D.C. Having lived in Southwest after moving to the District in 1978, seeing the changes that have taken place — and those still coming — is incredible. It is clear after 14 months in office that Mayor Bowser has dealt with a lot of issues she didn’t choose but has done so with compassion, intelligence and aplomb, always putting the interests of the people of the District first. The mayor has begun to make progress on her campaign promises. One of the biggest was committing to close the homeless shelter at D.C. General. Others included adding additional funds to build affordable housing; getting a handle on crime and improving public safety; and continuing to reform and improve the District’s education system. These are all areas difficult to impact but we are seeing positive changes and progress is being made on all of them. The mayor’s recently released plan to close the D.C. General homeless shelter is a case in point. It is a comprehensive plan she submitted to the public and the Council for review and while it isn’t perfect it deals with the issue in a smart way. In her speech, the mayor spoke of elected officials having three choices when building the city. “One is to reject growth and accept decline; two is growing without regard to our roots, and risk losing what makes D.C. great; and the third is to balance change with preservation and growth.” She has chosen the third and most difficult and is making progress in all eight wards of the city. The mayor gave credit to members of the Council and her predecessors Williams, Fenty and Gray when she spoke about changes that have occurred in the past 10 years, including school reform and school modernization. She touted existing successful programs, like having 500 mentors for boys who need it most; the money saved by families when Kids Ride Free on public transportation; 8,200 families reading to their children benefiting from the “Books from Birth” program; and various Cornerstone, Common Core and Career Academies. The mayor has been out in the community hosting budget engagement forums and giving residents a chance to speak out on what they see as priorities. Bowser has always prized community input and she isn’t only talking the talk but walking the walk in this regard. Based on community input, the mayor added $75 million to the school budget. With regard to public safety, she rightfully took credit for keeping Chief of Police Cathy Lanier in the District and luring the District’s new Fire Chief Gregory Dean from Seattle. She has budgeted $500,000 for security camera rebates for businesses and implemented the Body Worn Camera program for MPD officers with a commitment that by the end of the year every MPD officer will be wearing one. The mayor touted the city’s continued economic development from St. Elizabeth’s in Ward 8 to Columbia Heights, City Center and progress on the Walter Reed campus redevelopment. She made news when calling on the Council to increase the District’s minimum wage to $15 an hour by 2020. She touted her support for budget autonomy and then reminded everyone that based on the court decision this will be the first budget in which the city will control the funds it raises on its own. In all, this has been a great start for the Bowser administration and we can look forward to more progress under this mayor. So, do tell, Peter. How come Mayor Bowser has not issued an Executive Order banning non-essential DC government travel to North Carolina? Mayors of a half dozen cities and governors of at least FOUR states have already acted promptly to do that. Why not Mayor Bowser? Why should DC taxpayers– TODAY, RIGHT NOW– have their taxes used to support North Carolina’s implementation of its anti-LGBT law (HB2)? Why is the mayor of the nation’s capital not using her mayor’s ‘bully pulpit’ to publicly stand up for LGBT rights in North Carolina and elsewhere? Today, I was informed Councilmember Grosso, with the support of Councilmember Bonds, is working on a LGBT-specific bill that will be a more permanent solution. However, that will be dependent on Council votes, of course. And it will take quite a long time to craft and pass. Accordingly, there is no reason for Mayor Bowser to wait. And there is every reason for her to speak out and act boldly against this abuse of LGBTs in a nearby state. After a week of utter silence and inaction from DC’s mayor, on this issue this an embarrassment for DC’s LGBTs. Why can’t Mayor Bowser be just as edgy? Why not a mayoral invite to North Carolinians for Cherry Blossom Season –and– The Cherry Fund?